“QSO” is about believing the unbelievable and the cost of doing so. A host of a radio show about paranormal activity named Max Green is being targeted by Samaritan because he’s asked one too many questions. Samaritan is using the radio frequency to communicate with its operatives and Green’s interest in cracking the code poses a threat. Root takes on the guise of a radio station employee in order to save Green from an enemy that he doesn’t understand. A twist on the number of the week is that this particular man refuses to be saved. He has the choice to flee from Samaritan or stay and fight; he chooses the latter. This is a fairly standard rescue mission that fails because Green is willing to risk his life for his job–speaking out about the mysterious forces in the universe. This example of self-sacrifice parallels Team Machine’s willingness to give up their normal lives in order to battle a dangerous AI. The plot element of the paranormal radio show is a thoughtful way to explore the themes of the series, but it isn’t used to its full potential. 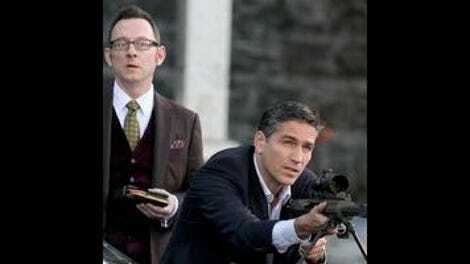 Person Of Interest engages in its share of broad humor, and its ability to sidestep a cartoonish depiction of Green’s character is admirable. At the same time, the writers missed an opportunity to really have fun with this premise; they could have taken a risk and let these actors loose in the final season. Green is played by Scott Adsit, an able comedian, and a radio show about paranormal activity is ripe for the kind of weirdness he and Amy Acker could have delivered. Person Of Interest has a specific tone that it strives to maintain, and the parameters feel especially constraining here whether they are dictated by CBS or not. Regardless of the episode’s untapped comedic potential, the writers wring the drama from this story in typical Person Of Interest fashion. The radio signal isn’t just an element that’s introduced in order to incorporate Samaritan into the story. Like usual, Root has Shaw on the brain and sees some untapped potential as well. If the enemy can use a radio signal for its own nefarious devices, then the heroes can surely take advantage of this tool too. Root sees a rare chance to communicate with Shaw and her timing could not have been better. Green’s mission to discover the truth at all costs may seem obsessive and paranoid but the journey that Shaw has been going on this season is a reminder of how precious the truth can be. The simple ability to discern reality from fantasy is taken for granted until that ability is gone. After undergoing simulation after simulation, Shaw’s sense of reality has been distorted by an enemy desperate for any means to defeat and control such a strong opponent. Shaw swiftly assassinates a target because she’s under the impression that she’s still undergoing a simulation. The reveal that she actually murdered an innocent victim in the real world is a reminder of her value as an asset; she’s a strong force of good on Team Machine but she can quickly become a dangerous weapon if employed by a villain like Samaritan. At her lowest, when she realizes that her mind is no longer her own, she decides to use her last bit of willpower to take herself out of the game, rejecting both sides of the war. Root’s signal interrupts her suicide attempt, however, and gives her the last bit of strength she needs to fight back. The idea of willpower and humans’ ability to choose what they do with their lives is addressed in the main story as well. Team Machine fails in their mission to protect Green, even if it is his own decision that leads to his death. Reese and Finch argue that the Machine should have enabled them to prevent Green’s death if it’s working properly. Root disagrees, asserting that it isn’t the Machine’s responsibility to prevent people from exercising their individual freedom. At the same time, it’s clear that Root’s perspective is colored by the value she sees in this case; she wouldn’t have wanted anything to have been done differently because Green’s radio show allowed her to signal Shaw. The show’s portrayal of the team members’ different relationships with the Machine and perspectives on AI has always been one of its strong points. This approach differentiates the characters’ voices, offering various organic opportunities for the ethics associated with the show’s premise to be debated. The team has remained united despite these conflicts, but the stakes of an upcoming war could threaten to tear them apart. Rifts in these partnerships are already appearing, as Fusco is exercising his own freedom by making an mportant decision of his own. He’s been injured and in the hospital, he realizes he’s no longer interested in being a part of a team that refuses to let him in on the very game they are playing. His abilities as a detective aren’t being respected, and Finch’s attempts at protecting him backfire. Like Green and Shaw, Fusco is only interested in the truth. “Reassortment” pairs an A-plot about a deadly viral outbreak with a B-plot that involves Shaw breaking out of prison—there’s a lot of breaking in general. Thankfully, much more lies beneath the surface of these simple plot descriptions. Numerous strands of plot intertwine, actually, and the fact that they’re tied together thematically results in a rich episode. A number actually ends up dying after being infected by an artificially-created super-virus. The hospital where he was staying, and where Finch and Reese find themselves, is quarantined and patients begin fighting over antivirals. It’s no surprise that the Stanford Prison Experiment is mentioned later in the episode; “Reassortment” partly concerns itself with the choices humans make in extreme situations. When imprisoned by outside forces, people’s behavior can be equally extreme, and can sometimes be very telling as to who they really are. In this case, the patients fighting one another could become as big of a threat as the virus itself. It turns out that Samaritan is behind the outbreak, targeting hospital admins questioning its manipulation of their database system. One of the admins is a traitor, however; he helped Samaritan because he believes that Samaritan’s mission is good. Human error is responsible for many hospital deaths and an automated system would prevent that loss of life. Here, the weight of devastating statistics become a kind of pressure cooker, and the admin makes an extreme decision thinking that he is helping people. People are poisoned supposedly for the greater good, which gets back to the idea of the end justifying the means yet again. Another person trapped in a kind of prison is Jeff Blackwell, who is the ex-convict now working for Samaritan, incidentally. He left one prison for another, and is now stealing antivirals on the enemy’s behalf. The inclusion of his ongoing plot this season is very smart since it puts a human face to Samaritan’s forces and residual damage. Like the hospital admin, Blackwell thinks he’s doing good. He is being told that working for Samaritan means both creating a better life for himself and helping to save the world. A promise of renewal is priceless for an ex-convict, and Blackwell goes along with Samaritan’s instructions no matter how harmful they seem. It becomes clear rather quickly that he will have less and less of a choice in the matter; he’s on the wrong team and his freedom is being stripped from him yet again. Blackwell is just another cog in the machine—or Samaritan, rather—and his individual life is less important than the fact that he’s a survivor who’s also impervious to avian flu. He’s a useful tool for this mission, a mission that also leads to the populace registering their medical information in the circumstance of this deadly outbreak. The show’s commentary regarding the dilemma between security and privacy resurfaces as Samaritan plans to use this data to “sort” people. That kind of terminology is never good, and the question is what happens to those who are likely to be deemed unfit. Does Samaritan mean to eliminate some people in order to “protect” humanity? Will the argument be made that the end justifies the means? Meanwhile, Shaw escapes either an actual prison or a prison of her own mind. She escapes Greer’s headquarters only to find herself in a South African cell. She encounters prisoners both hostile and friendly; their behavior is again indicative of the various ways in which people fight for survival. Shaw’s in the midst of her own battle. Worst of all, her mind is being used against her as she struggles to discern reality from the series of simulations she’s been forced to undergo. Shaw is a fighter, however, and she insists on persevering whether her present “reality” is true or false. This decision reveals a lot about her character and also ends up being the thing that saves her. A radio bulletin regarding the outbreak issued from her getaway car suggests that she’s escaped for good this time. Fusco is also struggling under the pressure of this war between the Machine and Samaritan. Unfortunately, in his case, the tension is creating a barrier between him and his teammates. Their secrecy makes him feel disempowered. This is Fusco’s state of being at this point, which usually amounts to the writers seemingly not knowing what to do with him, but his feelings coincide with the episode’s themes in this instance. Finch insists that he’s sparing Fusco the details in order to protect him, but Elias sees a darkness in Finch given his insistence on going it alone. Elias also reminds Finch that sacrifice is a necessary consequence of war in another iteration of this theme. There have been many losses so far; what’s next?